Say YES to ending the WOTC ! Lutheran Social Services is so desperate for more humans to traffic that they recently approached a state politician to ask for more refugees because they are running low on funds. They NEED more refugees for their program. For the record, this particular politician was extremely unimpressed with the lack of humanitarian in their "humanitarian" request for funds and warm bodies. I am not going to out this politician, but I suspect the group has approached the majority of politicians and candidates anyway. Frankly, I consider about 65% of current politicians dirty and about 80% of the current 2018 candidates seem to be slobbering all over themselves to get a slice of the human trafficking pie. If you do not think that human trafficking is a big money maker for Lutheran Social Services, consider that they have been laying off hundreds of people and closing offices across the nation since their refugee program has been thwarted. It makes up such a large percentage of their profits that the mere slowing down of the program causes them to falter financially. That is a portfolio that is heavy on the refugee trafficking and light on social services. When an agency has to petition to increase the level of refugees brought here to 75,000, you might need to question their motives. Why are they out hunting, harvesting, and gathering refugees? 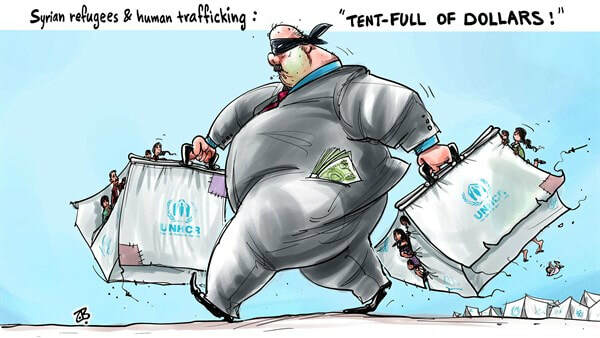 This is human trafficking! And billions of dollars exchanges hands internationally for this refugee trafficking. Yes, BILLIONS of dollars. Mayors, city council, other politicians, economic development groups, investors, immigration attorneys, SPLC, tax companies, specialized labor agencies, "humanitarian" groups, meat slaughtering plants, manufacturing plants, corporate ag businesses, academia, and more....they all make money through this human trafficking model. Just think of how many of those people fall into the human trafficking model at the beef plant in Aberdeen, SD, alone. Just ONE company. Adding insult to injury, our politicians and economic development group hands over millions and millions of economic development dollars to non South Dakota investors. Look at the history of owners and investors of the meat packing plant for an example. Their non South Dakota entities and investors seem to trend towards California. Of course they now use a hiring agency from a large progressive/socialist city in Texas. And they primarily ship in refugees from other areas to fill the jobs they created for our community. Human trafficking and tax harvesting is the actual business model for the meat plant. Slaughtering animals is just their sideline. The swamp does not let a penny get missed and human trafficking is a gold mine for them. One of their best piggy banks is the WOTC (tax credit). It is a pretty complex issue. One that I should devote a page to. For now, know that your tax dollars are used against you. They not only use the program to change the demographics of areas by moving people by the bus load to your town, the companies that use the program get tax benefits in the form of decreased labor costs. There are some restrictions though, most notably is that the employee must be a LEGAL resident. You will notice that after the DACA debacle and imminent removal of criminal aliens, that the forced diversity Mayor Levsen personally was at Molded Fiber to assist ICE. I guess diversity only counts when it is profitable? With the potential end of the money maker illegal alien scam, they gotta get the freeloaders out that do not meet their tax harvesting model and make room for the refugees to be churned between the companies using the program. Anyone else amused that cheap illegal aliens are now considered too expensive for profiteers? There is a hint at how much money they make with the new WOTC/Lutheran Social Services profit model. The WOTC was set to expire. This is coincidentally when Molded Fiber Glass in Aberdeen had lay offs "due to financial issues because production was down". Then the program was extended. Coincidentally, the same manufacturing company in Aberdeen began hiring again. Thune is pushing to make the WOTC permanent. If you want some sanity returned to the state and planet, do whatever you can to end this thing. Call and tell them the WOTC must expire! Be relentless and ruthless about it. Stick to your guns and do not allow them a second to try to manipulate you. Some will point out that the people it helps is veterans and other important groups. Yeah. Let's get a head count on how many conservative veterans are being helped by the WOTC. The only time the swamp helps the vets who are directly responsible for the liberty and freedom that we enjoy, is when they are looking for votes or cash. For example, years ago Starbucks promised to hire 10,000 veterans. They hired like 100 or something insulting like that. (Perhaps is it simply a common core math mistake?) Then, after telling Trump supporters and people who still believed in traditional marriage not to befoul their establishments with their presence, they vowed to hire 10,000 Syrians. The fallout has been spectacular. They then back-peddled and promised to hire 10,000 veterans. Too late, that public relations promise has already been made and broken once. But notice how they only promised to hire warm bodies that qualify for the WOTC tax harvesting scam. And vets were a mere afterthought to appeal to the pissed off conservative customer base. Meatpacking and Lutheran Social Services....human trafficking as a profit model. More info on human trafficking. MOLDED FIBER GLASS AND GENERAL ELECTRIC. I have to ask again...why are we shoveling South Dakota tax dollars and federal grant money at companies that are morally and ethically bankrupt and really do not benefit us? Seriously, the grandfather of planned obsolescence is a good fit for South Dakota? The six reactors in the 2011 Fukushima Daiichi Nuclear Power Plant catastrophe had been designed by General Electric. Their design had been criticised as far back as 1972. In March 2011, The New York Times reported that, despite earning $14.2 billion in worldwide profits, including more than $5 billion from U.S. operations, General Electric did not owe taxes in 2010. General Electric had a tax refund of $3.2 billion. This same article also pointed out that GE has reduced its American workforce by one fifth since 2002. The Times also reported that General Electric had been engineering tax reductions starting with the fees paid on its 1892 New York State charter. In December 2011, the non-partisan organization Public Campaign criticized General Electric for spending $84.35 million on lobbying and not paying any taxes during 2008–2010, instead getting $48.7 billion in tax rebates, despite making a profit of $10.4 billion, laying off 4,168 workers since 2008, and increasing executive pay by 27% to $75.9 million in 2010 for the top 5 executives. Between March 1990 and February 2001, General Electric was fined or ordered to pay damages by a court 420 times, amounting to at least $934,027,215, according to a report from the Multinational Monitor. General Electric was one of the pioneers and early widespread adopters of planned obsolescence, with a major part in the Phoebus cartel.